In a previous post (found here), I talked about the marvel that is the broccoli stalk. It is a part of the tree-like vegetable that is crisp like an apple, and mildly sweet like a cucumber. It tastes great cooked, but (in my opinion) is best savored raw. I love to slice a stalk into little coins and enjoy them with my salads. In this instance, they are simply paired with watercress leaves and a medley of grape tomatoes. The best part? Aside from looking like a pile of treasure on a plate? No dressing necessary! Just a light drizzle of extra virgin olive oil, because when you start with beautifully crisp flavors, there is no need to drown them with dressings. Shine on veggies, shine on! 2. Cut away the thick skin of the broccoli stalk to reveal the tender, slightly translucent center stalk. Slice into thin coins. 3. 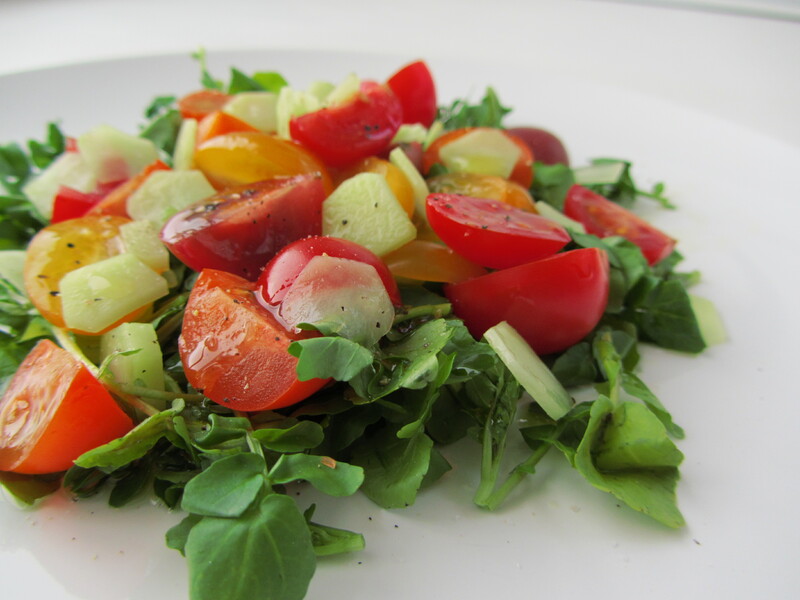 Toss the watercress leaves, tomatoes, and broccoli coins together. Dress with a light drizzle of extra virgin olive oil, and a pinch each of sea salt and fresh cracked pepper.